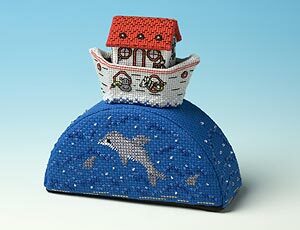 Noah's Ark perches on a blue wave, with dolphins and tiny fish swimming beneath it. Silver beads add to the watery feel, while Noah can be found on the cabin walls, talking to the Giraffe. The creatures depicted around the ark include a spider, an elephant, mice and a penguin, while the patient dove, returning with an olive branch, rests on the roof. This is a challenging piece to make but intriguing to work, bringing a real sense of achievement when it is completed. The Noah's Ark Paperweight is 12 cms high and 12 cms wide. The kit contains 18 and 14-count aida, stranded cotton, felt, wadding, plastic canvas, beads, needles, charts and full instructions - but no ballast.